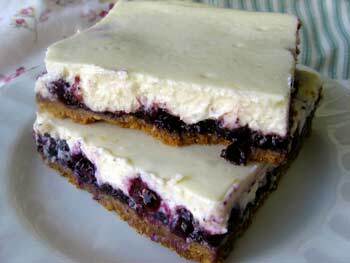 Take an easy recipe for homemade cheesecake bars and embellish it with a jar of blueberry jam and fresh blueberries and what do you get? A sensational blueberry cheesecake dessert, that's what! I love cheesecake but sometimes a whole cheesecake is more than I want or need. That's where homemade cheesecake bars come in. You get all the great flavor of cheesecake but in a more manageable amount. They are easier and don't require special equipment like springform pans too. I whipped up a batch of these lovely creamy Blueberry Cheesecake Bars recently and everyone loved them. Next time I may try them with strawberry jam and a cup of chopped fresh strawberries. The recipe suggests using graham cracker crumbs, but I think oatmeal cookie or shortbread cookie would be delicious too! And for even easier clean-up, line your baking pan with foil. Mix butter and graham cracker crumbs in a 9x13-inch baking pan. Press the mixture firmly into the bottom of the pan creating an even layer. Refrigerate while you prepare the filling. In a large mixing bowl beat the cream cheese with an electric mixer on medium high until creamy. Add sugar, eggs, vanilla, and lemon juice and beat until creamy and well blended. Stir the jam around in the jar until it is spreadable and then spread it evenly over the crust. Sprinkle blueberries over the jam. Spread the cream cheese mixture evenly over the blueberries. Bake for 30 minutes, until set and slightly puffed. Remove from the oven and allow to cool to room temperature before covering with plastic wrap and placing in the refrigerator to chill completely. 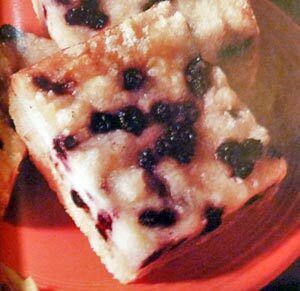 This recipe makes one 9x13-inch pan of Blueberry Cheesecake Bars. This easy bars recipe has all the elements of a traditional cheesecake: a graham cracker crumb crust, rich and creamy filling, and juicy fresh fruit. Preheat the oven to 325F degrees and position a rack in the middle of the oven. Press a 20-inch piece of aluminum foil into the bottom and over the sides of a 13x9-inch baking pan. Butter the foil. Stir together graham cracker crumbs, sugar and cinnamon. Add the butter and stir until moistened. Press the crumb mixture over the bottom and 1 inch up the sides of the prepared pan. Bake about 10 minutes, until slightly darkened. Transer pan to wire rack and cool slightly. In another bowl, whisk the eggs just until blended and set aside. In a large bowl, combine the cream cheese, sugar, vanilla and cinnamon. Using an electric mixer on medium speed, beat about 1 minute, until well blended, scraping down the sides of the bowl as necessary. Add the flour and beat just until incorporated, about 1 minute. Add half of the beaten eggs and beat until just evenly colored, about 3o seconds. Add the remaining eggs and best just until fully blended. Add the sour cream and beat just until incorporated, about 30 seconds. Using a large spoon, gently stir in the blueberries. Bake until the filling looks set and does not wobble when the pan is shaken, about 40 to 45 minutes. Transfer pan to a wire rack and cool until the top is room temperature, about 1 hour. Cover pan with plastic wrap and refrigerate for at least 4 hours to firm. Holding the ends of the foil, lift the bar to a cutting surface. Use a warmed knife to cut the bars into desired size and shape. Store bars in airtight container in the refrigerator for up to 3 days. This recipe makes one 9x13-inch pan of Easy Blueberry Cheesecake Bars. Preheat the oven to 350F degrees. Lightly grease 9-inch square baking pan. Rinse blueberries from mix with cold water and pat dry. In a medium mixing bowl, add muffin mix. Cut in butter with pastry blender . Stir in pecans. Bake crust for 15 minutes or until set. Add egg, lemon juice and lemon peel and mix well. Spread cream cheese mixture over crust and then sprinkle with blueberries. Sprinkle topping packet from mix over blueberry layer. Return pan to oven and bake another 35 to 40 minutes, or until filling is set. Remove from the oven and cool pan on wire rack. 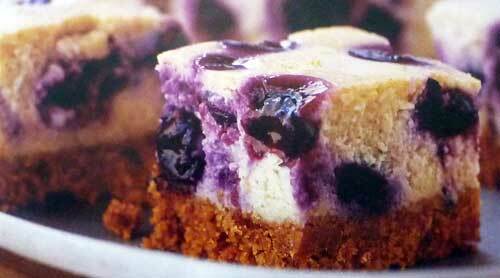 This recipe makes about 16 Blueberry Muffin Mix Cheesecake Bars.